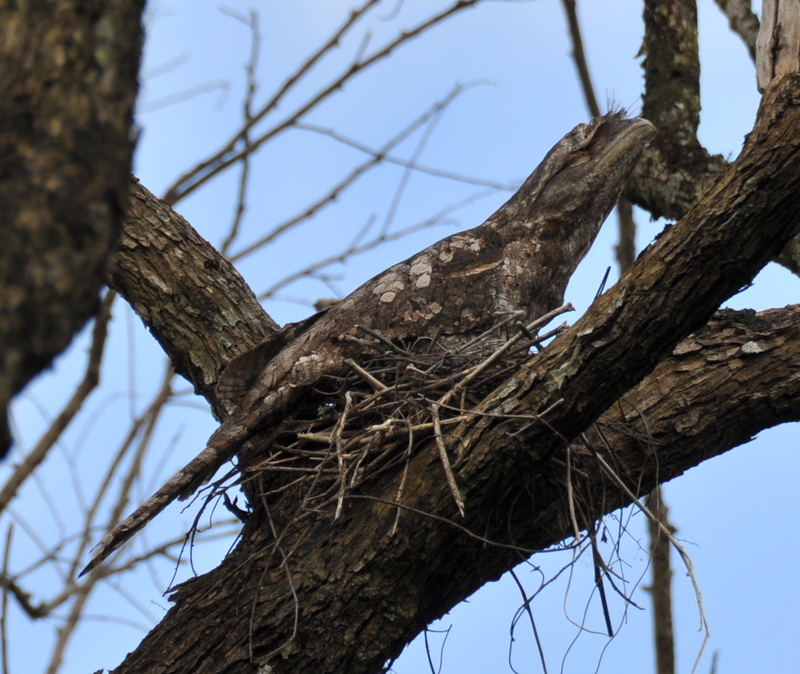 We often hear Papuan Frogmouth (Podargus papuensis) calling and sometimes see them at night when we are out collecting Cane Toads (Bufo marinus) but we don’t always know where they are nesting. However, this year we do know! The bird in this photo is nesting in a dead tree growing in a gully on the edge of our house garden, close to the vegetable section. From a weather point of view it is an exposed site and there is certainly no shade from the sun. Was it attracted to the grasshoppers which seem to proliferate amongst the leafy green vegetables? Papuan Frogmouth is not only the largest frogmouth in Australia but also the largest of the world’s 12 species. Although nearly the size of a Rufous Owl (Ninox rufa) one of its predators, it is only one-third the weight, its soft, loose feathering helping to give the impression of a greater size together with the bulky head and massive bill Some years ago we found a dead Papuan Frogmouth in the garden and I was amazed at how light it felt in my hands and so soft with its masses of beautifully patterned feathers. Hopefully we will have some further news to report on this nesting activity – we, well I confess it was Allen who saw it first a week ago but we don’t think it has been there very long. This entry was posted in Bird Observations and tagged Papuan Frogmouth. Bookmark the permalink. I’m really, really jealous. Hope you get some wild sounds too! I’ll do my best Tony! I’m guessing Allen did well to see it. I reckon it’s going to be an exciting time monitoring the progress. Not good news Gouldiae – yesterday morning the nest was deserted. No sign of Frogmouth last night ….. perhaps the choice of such an exposed position was indicative of a young pair nesting for the first time? Rufous Owl are also known inhabitants of this area…..? So many questions for which we will not have answers.